Westmead Hospital nurses Rebecca Halliwell, Jin-Chin and Maridy Morrison. 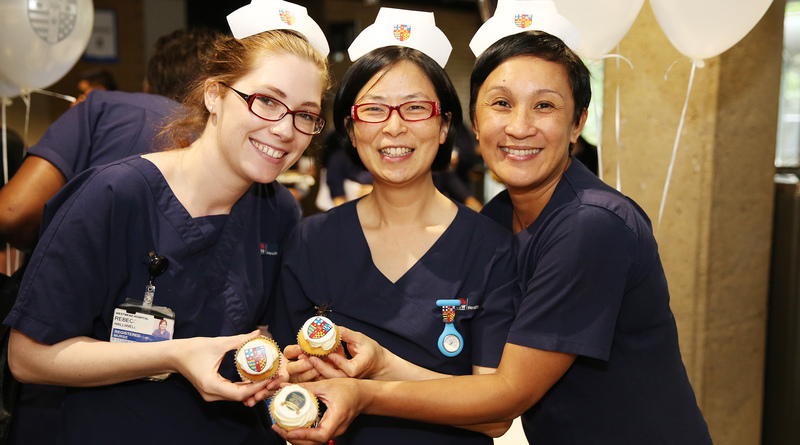 Westmead Hospital’s nurses and midwives were treated to an afternoon tea ahead of the hospital’s 40th birthday celebrations. Westmead Hospital director of nursing Kate Hackett said the nurses and midwives have made important contributions to the success of Westmead Hospital particularly in the areas of education and research. “It’s important for us to acknowledge and recognise the rich history of dedicated and skilled nurses and midwives at Westmead Hospital,” said Ms Hackett. “Our nurses and midwives are world renowned for their knowledge and technical skills. For further information about Westmead Hospital 40th birthday and Open Day, click here to view the program.